Born from extraordinary experiences, Calamity Gin is the spirit American Legends are made of. 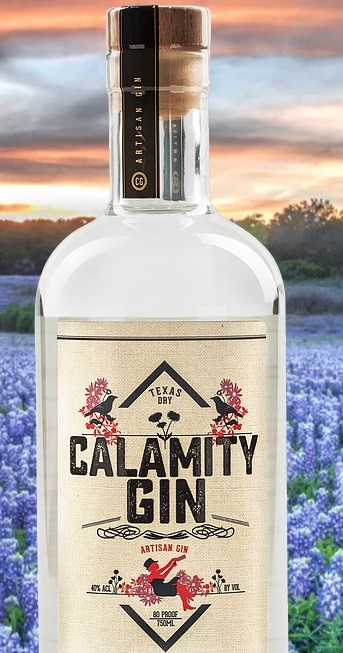 It's a unique, premium crafted Texas Dry Gin infused with wildflowers including Texas Bluebonnets. Through a unique combination of Old World and New World styles we have distilled a well balanced gin with mild juniper and floral notes and a fresh citrus finish. It's a unique taste we call “Texas Dry." Calamity Jane was a legendary character and icon of the American West. She was renowned for her sharp shooting and heavy drinking – but also for her heroism and charity towards others. Calamity Gin embodies the independent spirit of Calamity Jane and inspires all men and women to find their inner legend through confidence and determination.